A couple weeks, ago we ran an additional test of our long exposure settings on VMC. This time, we we upped the image exposure to 30 seconds. Just like with our Phobos images, its best to have a target to look at and for this test we used Jupiter. 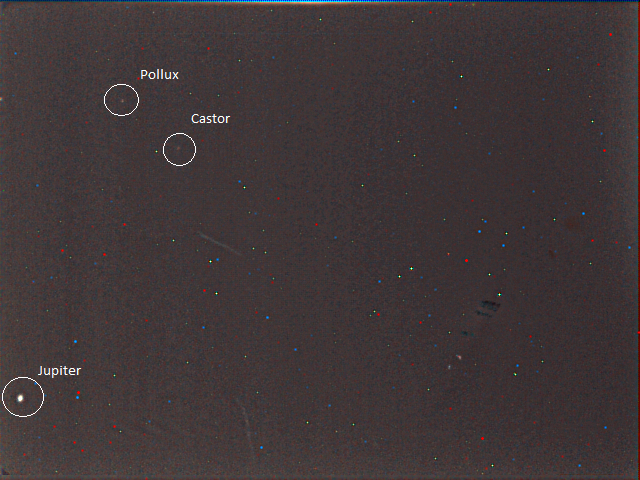 We found that, not only was Jupiter visible on just a 2-second exposure, but on the longer ones Jupiter was also visible together with the two twins of Gemini, Pollux and Castor. So in this set we have our first image of a planet other than Mars and also our first confirmed imaging of stars! The full image set along with all our other VMC images are in our Flickr channel. Would be interesting, if the VMC could be used to search for old defunct Martian artificial satellites, e.g., Mars-3, Mars-5 or Fobos-2. They are wrapped into white multilayer insulation, and are quite large with huge solar panels. I think it might be possible, under favorable light conditions. What do you think? fantastic , is it live webcam ? why not move ? This work is licensed under a Creative Commons Attribution-ShareAlike 3.0 IGO License. Details via this post.